Meet Gil "Hop"Hopkins — press man and all around fixer for "the nastiest, blackest-hearted team there is: Hollywood." It was by chance (also known as the library wait list) that I landed myself back in late-40s tinsel town so soon after finishing The Black Dahlia . And the similarities don't end with location alone; as Hop chases down loose ends even the boys down at the local Hearst-owned rag office thought this sordid tale "might be Daughter of Black Dahlia." But, for Megan Abbott , I'd go almost anywhere. The scene is set well, grime covered with layers of pancake makeup and the men upstairs running interference. For Hop, the search for some semblance of truth has tapped into something (Guilt? A conscience?) he thought he'd left behind long ago. "Beneath the hard stare, the pancake, the waxy coat of lipstick, beneath that…hell, Hop had long ago stopped looking beneath that. Chances were too great that the underneath was worse." Abbott does this breed of noir oh so well, but there was a certain feeling of intertwined closeness with the character, Hop in this case, that was lacking in comparison to the other two of hers ( Dare Me , and Queenpin ) I've read. I could speculate as to the gendered nature of this disconnect, but there are so many variables in the mix. In the end, my newfound love for Megan Abbott has landed her on a list of authors who I can only judge relative to their own greatness. So take this as three Megan Abbott-adjusted stars. 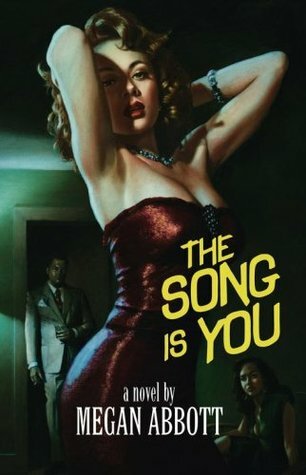 Sign into Goodreads to see if any of your friends have read The Song Is You. Like your new rating system for M.A. books! James wrote: "Like your new rating system for M.A. books!" Yeah, lady's just too good- gotta distinguish her relative excellence from her internal greatness. I have this on deck. Can't wait. Best cross dressing bikers menacing Archer GIF ever. Ever! Jeff wrote: "Best cross dressing bikers menacing Archer GIF ever. Ever!" Thanks! I actually made this one myself in photoshop, so I'm glad that John Waters directing The Road Warrior vibe came through! Star norming -- I like that. I originally read your review from a feed that did not include images, just the fact that there was an image. It won't surprise you to hear that my mind's eye had come up with one very different from the one actually shown. Steve wrote: "It won't surprise you to hear that my mind's eye had come up with one very different from the one actually shown." I feel like that speaks volumes about your mental health! Haha! Should we choose not to speculate about the state of your own, Mara? Ah, but it's Archer. Maybe that's all we need to know. Steve wrote: "Haha! Should we choose not to speculate about the state of your own, Mara? Ah, but it's Archer. Maybe that's all we need to know."